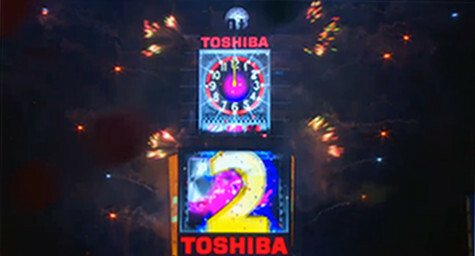 On New Year’s Eve, the much-anticipated ball drop in Times Square occurred from a building whose primary purpose is digital billboard advertising. Rather than earning revenue from rent, this building at One Times Square has been making much more money as a virtual billboard covered with digital ads. In addition to standing right in the center of one of the world’s most popular tourist destinations, the 25-story tower’s role as host to the famous New Year’s Eve ball drop gave the digital billboard ads global exposure to millions of people watching the big event on television. The Wall Street Journal reported on how digital outdoor advertising is building a big following. According to recent refinancing documents, this ad-centric building earns more than $23 million a year in revenue from digital signage rentals alone. 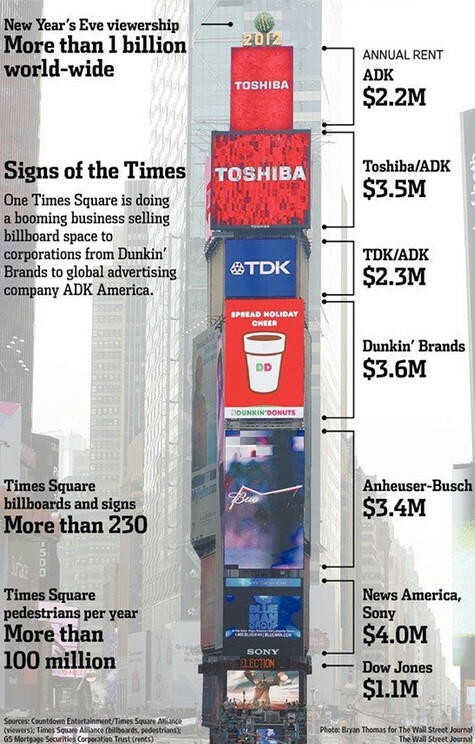 Both Anheuser-Busch and Dunkin’ Donuts pay more than $3 million a year for their digital signs, while Sony Corp. and News America share a digital sign with a price tag of $4 million. The building is home to a few companies, yet the majority of its revenue comes from its digital outdoor signage, which has given the tower an appraised value of $495 million. In comparison, this is more than double the value of a 31-story building nearby that’s filled with tenants and boasts more than six times the square footage. The success of the One Times Square building demonstrates the increasing value of digital outdoor advertising in one of the nation’s most popular tourist destinations. Based on the escalating tourism in New York City and the 100 million passersby in Times Square each year, the area’s digital sign rental rates have doubled in price over the last decade. Times Square now has the highest outdoor signage space rates in the world. Another factor driving this digital billboard dominance is that the momentum behind digital advertising has led many building owners to transform their static signs into digital signage. These digital platforms can be costly to build, but can ultimately command up to six times the rental rates of traditional outdoor advertising. In fact, the millions of dollars that these digital billboards can deliver have driven many of the city’s landlords to put up signage space on their own buildings. While the majority of advertisers lauds the outstanding exposure and reach that this digital outdoor advertising provides, there has been growing concern over exorbitant prices and oversaturation. Despite these objections, digital signage rental rates have continued to rise as advertisers have raced to claim their space on the world’s most popular stage. To discover how digital outdoor advertising can capture your audience’s attention, contact MDG Advertising. At MDG, a full-service advertising firm and one of Florida’s top integrated marketing agencies, our 360° approach uses just the right mix of traditional and online media to reach your digital marketing goals. While some industries may fare better in print and outdoor advertising, and others online, we strive to create a balanced approach where traditional and digital advertising efforts support each other and your marketing message is tailored to the medium. To stay on top of the latest trends in retail marketing that will make an impact for your brand, contact MDG Advertising.